Sicily your way. Ancient to Baroque. History, culture, cuisine and sunshine in an itinerary around Sicily in 9 days and 8 nights, from Taormina to Siracusa to Palermo and back to Taormina. The convenience of a (small) group tour with departures 51 weeks of the year. Maximum group size is 25. Departures are guaranteed with as few as two participants. Your delightful itinerary crosses Sicily from east to west, but starting and ending in Taormina, meaning that your arrival will be at Catania airport with a departure from Catania airport. 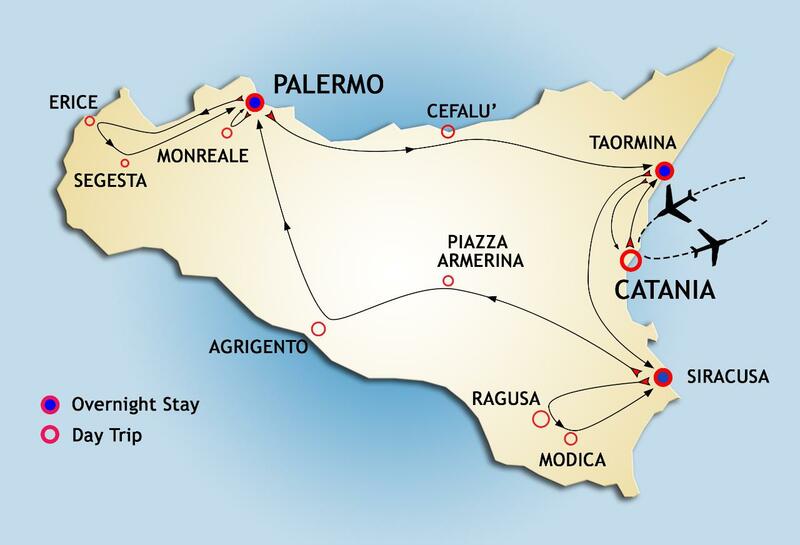 Thursday: Following breakfast and check-out, independent transfer to Catania Airport. (Information on airport transfers is provided near the end of this page). Please note major Italian legal holidays in 2016: 1 January, 6 January, 16 April (Easter), 17 April (Easter Monday), 25 April, 1 May, 2 June, 15 August, 1 November, 8 December, 25 December, 26 December. Airport Transfer: While there are buses, trains and taxis into Palermo and Taormina from Palermo's and Catania's airports, we can arrange a personalized transfer at €90.00 per person (based on a minimum of two passengers). Travel time in each case is approximately 50 minutes.